This is a copy of a post on another forum I made. 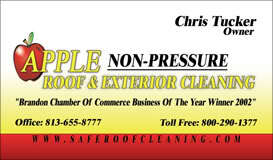 Read it,,and learn the secrets of cold weather roof cleaning. Chris, listen, many roof cleaners I have trained told me to use hot water with 1/2 to 3/4 cup TSP per gallon of mix. Mix the TSP and the HOT water first, then dump in the chlorine, if ya can. The TSP really help cold weather cleaning, as does the hot water. Then they make their mix on the strong side, like 60 percent chlorine to 40 gallons water/TSP. Tey pull up to the house, fire up the burner(do NOT boil peanuts) and using the PW wet one side of roof ONLY down with hot, but not scalding water. You also take your roof cleaning hose with you up on roof. Now, as SOON as you have wet down a ssection of roof, let the roof have the Love. The IDEA Chris is to make the roof cleaing solution Happy! NEVER attempt to clean a roof on a cold and CLOUDY Day, you need the Sun! Better to have 40 degrees and sunny, then 45 degrees and overcast! The reason you make a 60/40 mix Chris is because the hot water you have wet the roof with will automatically DILUTE the 60/40 mix down to ARCA and RCIA standards! I know, I know, TSP is a PITA to mix , but used correctly, it is your FRIEND, and you need all the friends ya can get taking on a light colored roof, in cold weather! For anyone reading this, do not wet roof with scalding hot water !!! The Frogs hate it, and it aint good for a roof either! Also,, some have reported to me that rubbing alcohol speeds up cold weather roof cleaning as well. Rubbing alcohol is an ingredient in Apple Cider anyway, but remember Apple Cider was developed in Florida ? The cold weather guys have told me that doubling the amount of rubbing alchol in the apple cider formula really helped in cold weather roof cleaning! Be advised that rubbing alcohol will burn your mix up faster, so make no more then needed that day ? IF doublingthe amount of rubbing alcohol in your cold weather roof cleaning mix, I suggest going UP to 1 cup TSP, to compensate for the loss of PH induced by the additional Isopropyl ? BTW, the rubbing alcohol is added LAST ! This complete cold weater roof cleaning information has never been posted on the RCIA Forum, probably because I never got around to it ? But God knows my friend Dave Westerman has given a LOT to RCIA, just wanted to re pay his kindness. So Chris, there you have it Son, the "secret" to cold weather roof cleaning, as best I know. The other "secret" is patience, us old men, and cold shingle roofs are stubborn, and take awhile to clean. Give the chemical TIME to work, and be aware it can take 20 minutes or so.